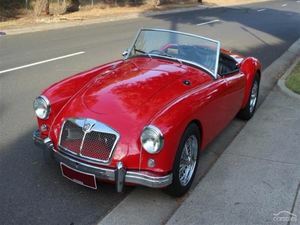 MGA Roadster 1956. This MGA has been restored with driving in mind, highlighted by recent engine, gear box and suspension performance work carried out. With a straight body and excellent interior, the centre laced chrome wire wheels, koni shock absorbers and a 5 speed Toyota gearbox make this a car to enjoy.